These a promotion notes which are updated daily. Some of the promotions are specific for today and others are available on a daily basis. All the promotions you see are valid and can be taken up. Do check as some might only be available to new players. Grab your Bingo Dabbers and head over to the fabulous 75-Ball Bingo Friday Fest at Sing Bingo. There are 5 cash prize pools of £1,000 for you to splash into! 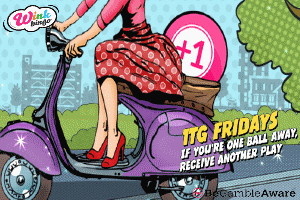 Collect your FREE cards in the Bingo Lobby if you’ve topped up in the last 6 days. This is a deposit Bonus game, so you need to be registered at Sing Bingo to take part in the Friday Fest. T&C’s apply. There’s a Gold Rush at Tombola Arcade and it’s Dynamite! The newest addition to the brilliant Tombola Arcade is here with a BANG! Welcome to the fabulous Gold Rush, a game with exploding wilds and top bonus rounds. A cascading slot that has it all. You need to be registered at Tombola or Tombola Arcade to play Gold Rush, so register and let the spins begin. T&C’s apply. There’s another fabulous £35,000 to share in Tombola World! Register and get your unique code sent via SMS, then play for your share for just 1p each day. You don't have to play every day to win a prize so go and get your code to play! So far, Tombola has given away a staggering £300,000 since Worlds began. T&C’s apply. 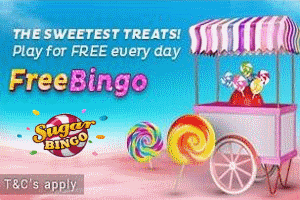 Tasty Bingo’s fabulous Free Treats Tab is fully stocked with a cool £300 in Free Bingo every day. If you’re new to Tasty this is the room for you and you have 3 days to play! There is a mix of 75 ball and 90 Ball games with games all day every day. You need to be registered and have deposited within the last 7 days. Jackpot prizes will be credited in real money funds. This is a shared game. Wagering requirements apply. Deposit can be withdrawn at any time. T&C’s apply. There’s a whole week’s worth of fabulous Freebie Fun at Wink Bingo. From the fab Free for all £1-2 in bonuses, Free (£10) Tenners, Forever Free £50, £250 Free Sunday games to the mega £1k newbies games. All games are shared and max ticket per game is 6 per player. Some games are restricted, so read the T&C’s before playing. Wagering requirements and full T&C’s apply. The brilliant Bingo Vegas at Costa is a little slice of Las Vegas style Bingo. All the glitz and glamour from 20p a card. Game play is simple, buy a card (called a hand) and the first player to cover their cards bags the pot. 18+ players only. Wagering requirements apply. Registered players only. Robin Hood Bingo are at it again with the fabulous Play Free Win Real No Deposit freebies. It’s a New player promotion so all newbies get access to the Free Bingo at NO COST, just a cool £900 up for grabs. Get 3 days access to Free bingo, with no deposit required. All you need to do is register and make your first deposit (£10 min), then head to the Biggie room for the chance to win up to a £50 daily jackpot. *This is a Robin Hood Bingo promotion, so full T&C's apply. 18+ players only. Minimum depositing requirements apply. Funded players only. Full T&C’s apply. Read before depositing. Really money Sweet Dreams at Wink Bingo plays every night in the 5 line Bingo room. Tickets cost 5p each with £250 pots split into 5 lines. 1L wins £50, 2L wins £50, 3L wins £50, 4L wins £50 and 5L wins £50. T&C’s apply. 18+ players only. Funded players only. Read T&C’s before depositing. 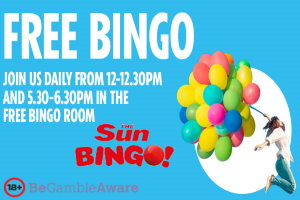 There isn’t much in life that’s Free, so here’s a little something from Sun Bingo. FREE Bingo every day. Tickets really are FREE and you get to keep what you win! Play 14 fabulous Free games with cash prizes for a Full House is £10, 2 Lines is £6 and 1 Line is £4. That’s a cool £280 in FREE cash prizes to be won daily! T&C’s apply. 18+ players only. Promotion open to UK or Ireland players. Read T&C’s before depositing. It’s not always about the massive pots and the millionaire Jackpots, sometimes the Penny Bingo Specials do the trick. Room opens every evening in the 90 Ball room at Sparkling Bingo for 4 hours of fabulously cheap Bingo. Sliding Jackpots, Fixed Jackpots and Progressive Jackpots games all under one roof. 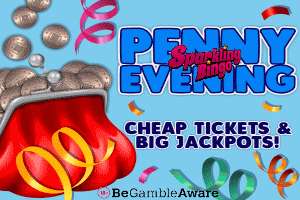 You need to be a registered player at Sparkling Bingo to take part in this promotion. T&C’s apply. Fancy something a little cheaper with all the thrills of a big game? Welcome to the brilliant 1p Set list and the weekly £1,500 pot at Sing Bingo. There’s a £20 jackpot every day in the 1p Set List room. Games play every hour from 2pm to midnight. This is a 75-ball room with three chances to win. 2TG share £4, 1TG share £6 and Full House wins £10. 11 chance to win every day T&C’s apply. It’s time to think outside the box with BGO Bingo’s brilliant Cash Cubes. It’s bingo but not as you know it. This is a super-quick 36-ball game, that releases cubes which when you call house. These are added to a Cubes Collection. Once 50 cubes have been collected a Cash Cubes Bingo Bonus is unlocked! There are four different ticket prices available. Try your luck and smash your way to a win. T&C’s apply. 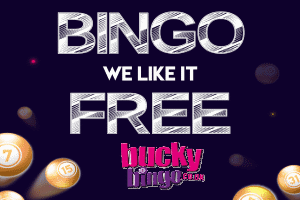 Bucky Bingo like it Free and so do we, so head over to the BB Free Room daily from 10am-11am and 10pm-11pm for some Bucky Freebies. 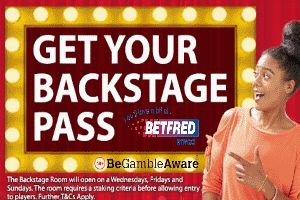 You need to have deposited in the last 30 days to get entry to the Free Bingo Room. 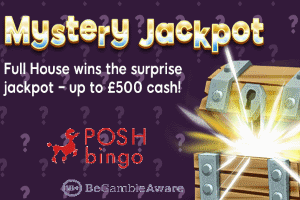 Join in with Posh’s Mystery Jackpot and let the surprise take this fabulous 75 Ball Bingo game to a new level. 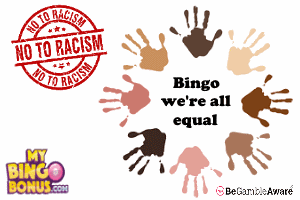 Bingo with a twist, a twist that could drop anything from £10 to £500 in cash to the pot. Game plays daily in the Mystery Jackpot Room between 6pm – 11pm. Tickets are 10p each. T&C’s apply. Jackpot revealed 10 seconds before game starts. Tickets cannot be bought once the Mystery Jackpot is revealed. 18+ players only. Promotion open to players from UK. Read T&C’s before depositing. Play Bingo for Free with the Sweetest Treats at Sugar Bingo. Sugar Bingo has four special Free Bingo rooms with loads of winning without spending a penny. The Biggie, The Grand, The Ultra, and The Supreme for the tastiest bingo treats. This is a Sugar Bingo promotion, so T&C’s apply. 18+ players only. New and VIP players only. Full Bonus policy applies. Read T&C’s before depositing. Unwind to go with a tasty wagering jackpot to be won every 90 seconds in the 75 Ball game. PLUS, a fast and furious progressive jackpot. The best of Bingo to go in this Mobile Only game. 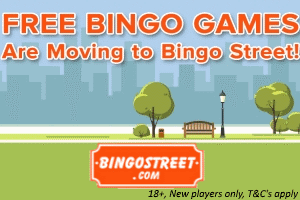 The brilliant New Free Bingo tab is the latest BingoStreet Freebies to get us all excited. It’s the new home to more Free Games and Bonuses. The 75 Ball Bingo Freebie is newbies only, with an exclusive chance to win up to £300 every day. No deposit needed and 3 days to play! 18+ players only. Minimum Wagering requirements apply. New players only. Full T&C’s apply. Read before depositing.